[By Nick] Blue Moon is definitely the “mystery” flavor of the ice cream world. Hell, there’s even a Wikipedia page for it. It seems as if everyone believes they know what it truly is, yet the discrepancy between flavors is astounding. I mean if one person thinks it tastes like Fruit Loops while another is definite it tastes like soda, there has to be something up with this flavor. Being that this had me very intrigued, I added a couple of Cedar Crest Blue Moon Ice Cream Cookie Sandwiches to my Ice Cream Source order. The description I got from the website is extremely vague. Simply put its blue moon ice cream in between two cookies. Now I have no idea what flavor the cookies are or if they’re more wafer like than cookie. The packaging it just a blank white wrapper, which is just disappointing for something that doesn’t come in its own box. Okay time to stop delaying, here goes nothing. Well that’s a brighter blue than I expected. This is not a color you’ll be finding in nature any time soon. 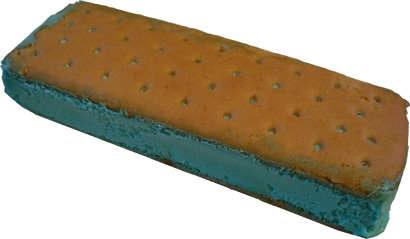 These are the kind of ice cream sandwiches I’d imagine Gargamel eating (Smurfs reference ftw). So it looks as if it’s blue moon ice cream with vanilla wafers. Taking my first bite, I’m struck with a familiar flavor that I just can’t pinpoint. After a second it hit me, THESE TASTE LIKE FRUITY PEBBLES. Well more of a generic fruity pebbles with that “artificial this isn’t real fruit” taste. Now I’m not going to get into detail on how fruity pebbles taste seeing as I hope a majority of you already know what I’m talking about. If you don’t and were deprived as a child, go out and buy a box. It’ll broaden your horizons. The vanilla wafers on the other hand were practically a non-factor. There was a faint vanilla flavor in the after taste but other than that it seemed that their main purpose was to provide a support structure for the treat. That’s a shame because I feel if the vanilla was stronger, it would’ve complimented the ice cream and helped to mellowed out the predominate “fruit” flavor. I felt like this was a nice change of pace when it comes to the basic vanilla/chocolate ice cream sandwich world. I can truly see why there is such devotion for this stuff in the Upper Midwest and the variation in people’s perception on what the true flavor is. If you’ve ever had Blue Moon, leave a comment and let me know what you think the flavor is. I’m interested on seeing what other people come up with. Whatever happened to "Not Labeled for Individual Retail Sale"? and what do I think blue moon taste like? FROOT LOOPS! Blue Moon. Sounds like it's made from Blue Milk. How's that for a New Hope reference? Nick, you dig up some strange stuff, but when you said it tastes like Fruity Pebbles, you sold me. I knew the cereal aficionados would enjoy this review. The stuff I'm reviewing right now all come from my order from ice cream source. They have a bunch of random/interesting things there. Once I get through those, if Dubba decides to take me in as his young padawan, I'll be moving towards the more mainstream products aha. Glad to see a guest reviewer and a great one at that! Why does everyone say Blue Moon originated in the upper Midwest? It originated in Erie, Pa. in 1953! If anyone can find an earlier reference I'll stand corrected. It was first concocted at Dari Creem at 715 Parade St. This stand has since closed, but another Denny's at 10th and Parade serves it all the time. There are at lkeast 10 stands selling it in Erie. And it's blueberry! Not raspberry! Anon, I was going on wikipedia's information. I wouldn't say this reminded me of either raspberry or blueberry but just a generic berry flavor you'd associate with fruity pebbles. Like I said it's the mystery flavor of the ice cream world and we'll never know where it originated or what flavor it actually is! Blue moon ice cream tastes like "Blue tail fly" ice cream drinks. Drinks are made with blue curacao + crème de cacao or amaretto + vanilla ice cream mixed in a blender. When I have Blue Moon ice cream, it usually tastes like almond/amaretto.